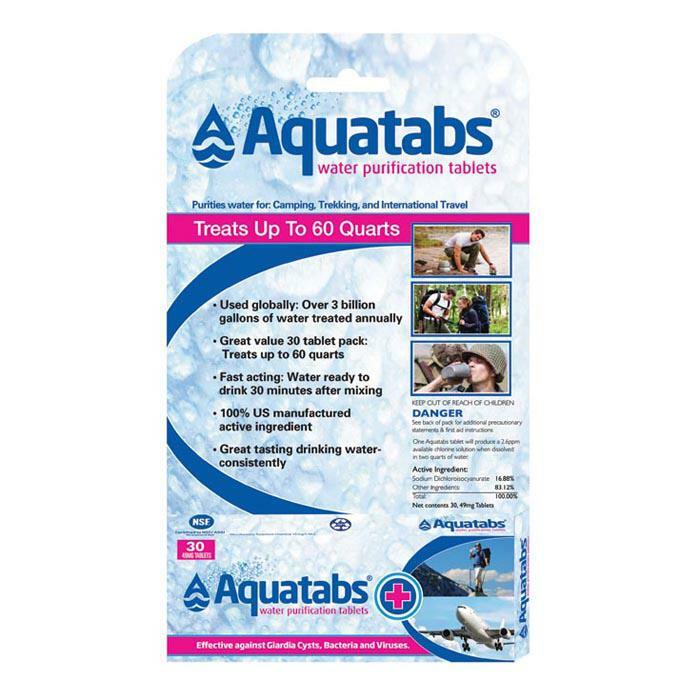 Aquatabs are safe, simple iodine-free water purification tablets that effectively kill micro-organisms found in water such as Giardia cysts, bacteria & viruses. Fast acting effervescent (fizzy) formula - water is ready to drink in 30 minutes after mixing with no unpleasant taste or odor. Aquatabs NaDCC formula has been used by aid agencies in emergencies, NGO's & Defense Forces around the world for over 20 years. Produced to international standards for use in drinking water with NSF/ANSI Standard 60 certification. 30 tablet foil pack treats up to 60 quarts.